At the tip of the island, the former sugar plantation that is now St Lucia’s Cap Estate is blessed with unparalleled panoramic views of where Caribbean Sea meets Atlantic Ocean. The boutique resort of Cap Maison makes the very best of these views and is designed to feel as if you are visiting your own private Caribbean residence. For dining with a view look no further than the award-winning destination restaurant, Cliff at Cap, with an innovative French West Indies fusion menu. It’s strategically placed atop the Cliff with a sunset lookout for happy hour cocktails. The pool adjacent to the restaurant enjoys the same views from its sun deck and there is an adjacent secluded beach cove appropriately named The Naked Fisherman beach restaurant. Take the 90 steps down to the sand and you’ll find a rustic beach bar serving up lunch time grills, freshly squeezed juices and wonderful rum concoctions. Kayaks, snorkels and Hobie cats are complimentary to guests or you can take some tuition for a fee. Spa Maison and the fitness centre are available for further rejuvenating body and mind; on hand there is a pilates/yoga instructor and a fitness trainer to lead morning jogs across the estate. The Cap Estate’s rolling hills have also become home to the 18-hole St Lucia Golf & Country Club. Guests at Cap Maison benefit from concessionary golf at this beautiful and challenging championship course which extends virtually from the Caribbean to the Atlantic coastlines (a complimentary shuttle takes approximately 5 minutes). On St Lucia’s northwest coast, atop a private ocean-front bluff with stunning views of Smuggler&apos;s Cove Beach and the Caribbean Sea. Transfer time from airport: 90 minutes. 49 rooms, junior suites and 1-, 2- and 3-Bedroom Villa Suites all appointed with furnished verandas, ceiling fan, air-conditioning, flat-screen TV, BOSE iPod docking station, DVD player, tea/coffee-making facilities and mini-bar*. Garden View Rooms with a balcony or terrace allowing for outside dining surrounded by tropical gardens. These rooms have 1 king-size bed or twin beds, sleeping maximum 2 adults. Cap It all inclusive option: available at a supplement and includes lunch at the Cliff at Cap Restaurant or The Naked Fisherman Beach Bar & Grill. Dinner daily from the Cap It All menu at the Cliff at Cap Restaurant or The Naked Fisherman Beach Bar & Grill. All drinks including soft drinks, house spirits, house cocktails, house wine, all by the glass. Please note: guests choose from the Simply Maison dinner menu which has been created by Executive Chef Craig Jones, with a choice to sample the a la carte menu at a supplement payable locally. Half Board option: available at a supplement and includes either lunch or dinner (food only). Junior Suites with a private verandah offering partial ocean views and views over the tropical gardens, 1 king-size bed sleeping maximum 2 adults and 1 child. 1-Bedroom Villas sleep maximum 2 adults and 2 children. 1-Bedroom Ocean View Villa Suites, located in Spanish courtyard with pool, are large split level suites with a downstairs living/dining area and private verandah. Upstairs, there is a four-poster king-size bed, walk-in wardrobe and an outside private Jacuzzi on the balcony. Sleeping maximum 2 adults and 2 children. 1-Bedroom Ocean View Villa Suite with Pool are located on the ground floor and have a large dining area and separate living area. Ideal for families, sleeping maximum 2 adults and 2 children. 1-Bedroom Ocean View Villa Suite with Pool and Roof Terrace offer spacious, luxury accommodation. There is an upstairs where you will find the roof terrace with a private pool, sun loungers and a dining area with spectacular views over the Caribbean Sea and the mountains. Sleeping maximum 2 adults and 2 children. Children under the age of 7 are not permitted in these suites. 2-Bedroom Villas are made up of a Villa Suite and an interconnecting Garden View Room, sleeping maximum 4 adults and 2 children. 2-Bedroom Ocean View with Plunge Pool sleep maximum 4 adults and 2 children. 2-Bedroom Ocean View Suite with Pool and Roof Terrace sleep maximum 4 adults and 2 children. Children under the age of 7 are not permitted in these suites. 3-Bedroom Villa Suites are made up of a Villa Suite, an interconnecting Garden View Room and the adjacent Ocean View Junior Suite, sleeping maximum 6 adults and 2 children. 3-Bedroom Villa with Pool sleep maximum 6 adults and 2 children. 3-Bedroom Ocean View Villa Suite with Pool and Roof Terrace sleep maximum 6 adults and 2 children. Children under the age of 7 are not permitted in these suites. Please note: For safety reasons children under the age of 7 are not permitted in Villa Suites with Private Pools and Roof Terraces. 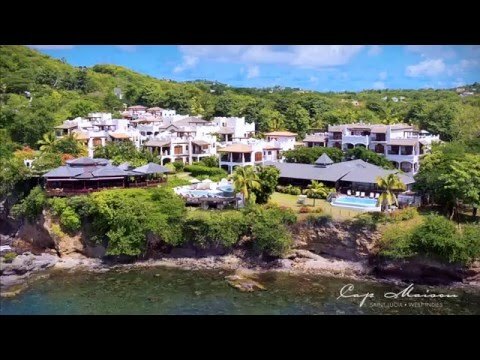 The Cliff at Cap Restaurant (fine dining, breakfast, lunch and dinner, earlier dining time for children on request), Cliff Bar, Wine Cellar, The Naked Fisherman Beach Bar & Grill, Champagne Zip Line, library/lounge with honour bar. Rock Maison and Wine Cellar available for private dining. Room service* (6:30am-10:00pm). Large freeform swimming pool with sundeck and loungers, cliff-top Jacuzzi and courtyard pool. Fitness centre with fully-equipped gym and exercise classes including yoga. Spa Maison*. Cap Maison Running and Hiking Club. Water sports including snorkelling, windsurfing, diving*, sea kayaking and Hobie Cats. 46&apos; Sea Ray Motor Launch can be chartered privately by Cap Maison guests for day cruises to other parts of the island*. St Lucia Golf and Country Club is minutes away with guests enjoying concessionary fees. Participating hotel in St Lucia Triathlon. Air-conditioned lounge/library with big screen TV. Dry-cleaning/laundry service*. Complimentary WiFi available. 3 nights between 3 Jan–18 Dec.
5 nights between 19 Dec–26 Dec.
7 nights between 27 Dec–2 Jan. Please note: childen under the age of 7 will not be allocated upper floor suites. Please note: for safety reasons, children under the age of 7 are not permitted in Villa Suites with Private Pools and Roof Terraces.